John Coleman has targeted a return to full-time management after leaving his position as Southport boss. The 51-year-old parted company with the Sandgrounders on Tuesday, having kept them in the Conference Premier during his five months in charge of the club. Coleman told BBC Radio Lancashire he would happily take a job with another Conference side. "I may have to lower my sights and take another Conference club into the Football League," he said. "My prime objective is to get back into full-time football, whether that's in the Conference or in the Football League. "Myself and [assistant] Jimmy Bell worked so hard to get into full-time football and we enjoyed it so much - we really do miss it." Coleman spent more than 12 years as Accrington manager and guided Stanley into the Football League in 2006. 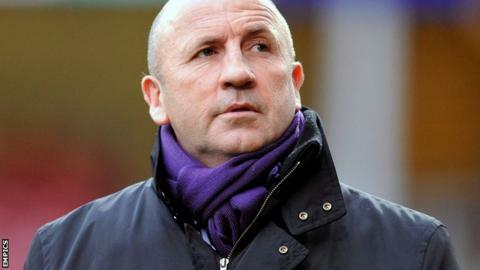 He also managed Rochdale for a year before replacing Alan Wright at Southport in December. He admitted that he had found the transition between full-time and part-time football a difficult one, and accepted that the club's hierarchy may not have been happy with his style of management. However, Coleman said there was no animosity between himself and the club following his departure. "There are no hard feelings from me," he added. "I enjoyed my time there and I'd like to thank all the people that helped me while I was there. "The fans were brilliant with me, and the players really put a shift in and did their utmost to keep Southport up."